If you are a game lover, then you will never want to miss these game cartridge card. They are classic games for N64, and they are perfect party game for you to play with friends. All items have been tested and work great. Light-weight and travel-friendly, easy to carry. Rich, complex game world filled with detail and variety. 18 kinds of games included, make your leisure time fulfiied with fun. 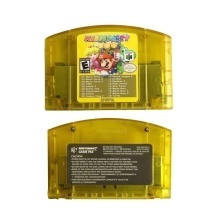 USA version for N64, please check the version before you choose the game card.